A brilliant suggestion from Parent Hacks (and through Lifehacker) is to add an extra curtain rod to your shower, on which to hang and dry the bathing suits and extra towels brought by summer swimmin'. The image at left is actually an overpriced "dual shower rod & towel rack," but an extra $10 rod from Walmart will do the trick just as well. It's not that this technique doesn't have its faults - after all, the drying items might get wet all over again anytime someone takes a shower - but it rates pretty highly for convenience. So why isn't this seen in practice more often? Why isn't this the standard in homes, instead of a niche technique that needs to be discovered on a blog? It seems that this is a case of traditional, normal designs standing in the way of progress. 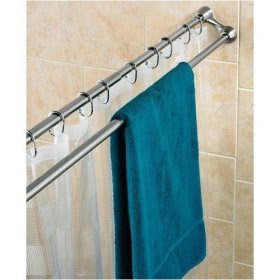 A shower rod is understood, familiar, and has remained relatively unchanged for a century or more. No interior designer has ever earned the scorn of the client for sticking to the norm in this area. And so it stays the same, even when something more useful is out there - it's a cycle familiarity that's difficult to break. But, dare to break it, and there can be rewards in the form of a slightly easier, slightly more convenient life. Magtable - The random-magazine experience? 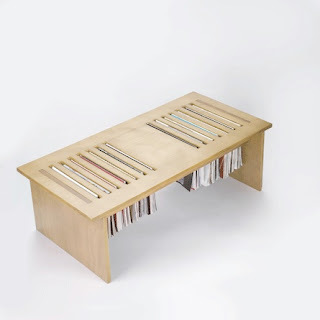 From Satina Turner at Umbra, the Magtable Coffee Table certainly has that je-ne-sais-quois "neato" factor. Maybe it's just the clean, practical design. Maybe it's the efficient use of the space under the table. Maybe it's the notion that the mail-in cards will fall out of each magazine as it's inserted into the table, so they can be gotten rid of once and for all. Whatever it is, it's slick. But one thing can't escape my mind about the actual use of this product, which could be viewed either as fault or feature. Unless the user subscribes exclusively to magazines thick enough to bear their titles on the spines, picking a magazine is going to be a random experience. Fine for the adventurous, but not for for those who don't like surprises. Either way, it doesn't put a bit of a dent in that "neato" quality! 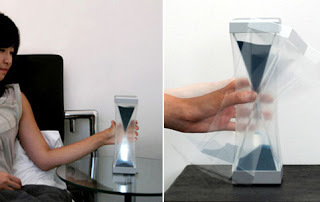 From designer Sun-Young Lee on Yanko Design (and through Gizmodo), the Hourglass Worth of Light provides wonderful clarity of function to the user. There's no doubt in any user's mind that this baby will stay lit until the sand runs out, and no question that it'll then turn itself off. This is accomplished by calling iconic and well-understood forms to task (who doesn't recognize an hourglass? ), rather than creating new instructions, controls, or displays for the purpose. The result is an immediately understood function - and no extra visual garbage. 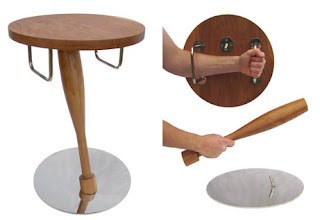 I haven't seen a better example of form serving function in quite a while! It often seems that the Internet has ushered in an era of non-productivity which more than offsets the era of productivity for which it's been hailed. The culprits are those sites that leech our time away: the Facebooks, the ESPNs, the gossip sites, and the blogs (um, some blogs). How can we keep ourselves away from these leeches on our time? As is often the case in products or systems designed to curb undesirable behavior, a solution can be just to make that undesirable behavior less convenient. Enter LeechBlock, a Firefox extension by James Anderson which allows the user to block his own access to certain sites during certain times of the day. Of course, the user can always turn off this setting - he still actually has control over everything - but he appears to himself to be constrained by an outside entity. To actually return to the settings and remove the block would take conscious and premeditated action - not like the casual time-wasting into which it's so easy to slip on leech sites - and therefore force the user to admit weakness and defeat. And by golly, when that's the only other option, actually doing work starts to look a lot better! In the never-ending, always-annoying battle between wall warts and electrical outlet space, a new entrant marks a small victory for the oversized socket hogs out there. 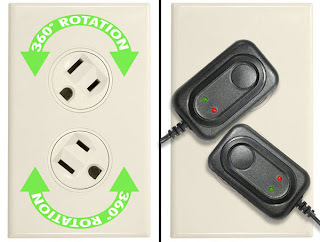 From SmartHome (and through Gizmodo), the 360-Degree Rotating Outlet does exactly what its name says: just spin the sockets until your wall warts get along. Aside from sometimes being a fun little tetris-like puzzle, this is a nice solution. 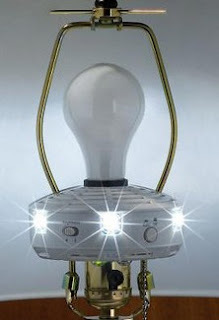 Certainly more elegant than the otherwise useful PowerSquid, but the cost is a more involved home installation. The only problem I can think of is the borderline-OCD resident of the home who just needs the sockets to be straight - and nothing to grab onto to spin an empty socket but the slots themselves. A dangerous combination...? Sometimes a sneeze packs more of a punch than normal, and a regular hanky or Kleenex might let a bit of the, uh, "shrapnel" fly through the crease. Enter the NosePouch (via Gizmodo), whose makers are counting on that being enough of a problem to justify their product. A small extra flap catches any excess - and probably comfortably cradles the schnoz as well. But for this small added functionality, there's a lot of baggage: from a usability standpoint, the eponymous pouch has to be properly oriented and aligned to do its job, and quick-acting sneezes aren't often that forgiving. 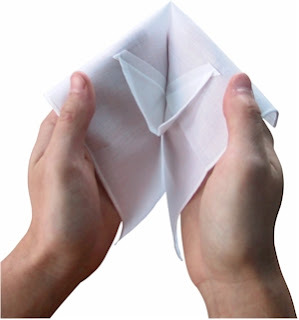 Plus, the elegantly simple, versatile handkerchief must be traded in for a clunky one-trick pony. More than a conversation piece, something about this product begs to be an unfortunate punchline. And one more thing - the website definitely doesn't help, with design seemingly inspired by late-night informercials and early-90's page layout. And the slogans: "The newest functional innovation in a handkerchief Since The Dark Ages!" "Say good-bye to embarrassing messy dishonorable discharge forever!" "Don't call it a handkerchief..."
...Don't call it mine, either! ...But a lot of things are good ideas in theory. Like communism. 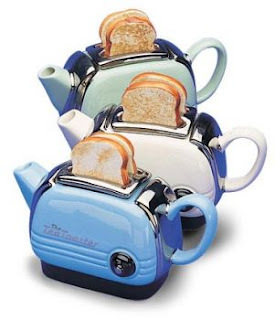 This one seems to make sense at first thought - tea and toast together! - but something about the execution is horribly, horribly wrong. It's the Toaster Teapot, from the Teapottery via Gizmodo. So what makes this not work, exactly? Functionally, it probably works just fine. Is the problem with the industrial design, which looks like some unholy genetic experiment melding 60's-era teapots and toasters? Is it the unsettling combination of liquids and toasters, a question astutely observed by Gizmodo to be the province of "philosophers and coroners?" 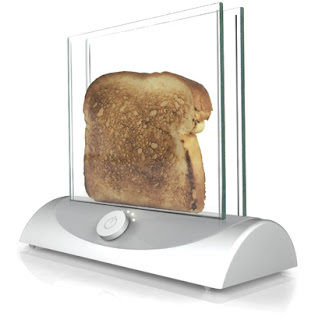 Is it maybe just the fact that tea and toast need not always be served together? Or is it just one of those gut feelings, that this doesn't work? Maybe. Sometimes you just know it when you see it. Sometimes a product's purpose is explicitly to correct for bizarre human foibles. In this case, there's something about the human mind that is incapable of spotting a horrific gaffe in an email until the second after the "send" button is pressed. It's like forgetting something when you're leaving on a trip: you don't remember it when you're doing your final check, you only remember it once you're in the car and just hit the road. It's the kind of thing that just gets you mad at yourself! While I won't speculate about whatever psychological defect must be responsible for this, I can appreciate a designed which accommodates it. 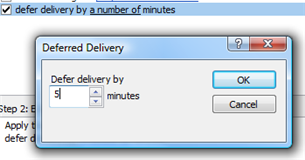 As pointed out by The How-To Geek (and through Lifehacker), Microsoft Outlook allows users to defer email delivery by any specified number of minutes after the "send" button is pressed. Just like the procrastinator's clock, this is merely a trick that a person decides to play on him/herself: there's no real difference between using this setting and merely waiting five minutes before pressing "send." But the trick works, the mind is fooled into betraying the errors it somehow knew it made - and a product's design is validated! 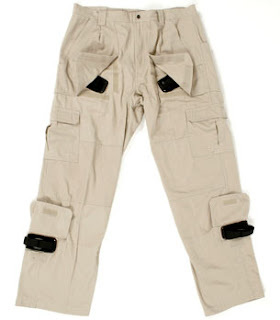 From Blackhawk Products Group (and through Engadget) comes a useful, if somewhat morbid, design for combat wear: clothing with integrated tourniquets. Since time can mean the difference between injury and casualty when stopping blood loss after an incident, it can definitely help to already have the tourniquet where it's needed. Not much more to say - it's one of those designs that can make a difference, and which regardless of one's politics, we can all hope finds its way to those who need it. Beaches as Products: Does banning work improve them? Ahhh, beaches! 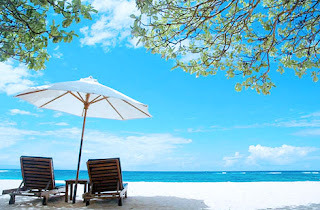 Idyllic tropical beaches are usually thought of as locations, but in possibly more important ways, they're full-fledged products which (lucky us) can be subjected to the usual analytical drubbing provided here on Unpressable Buttons. They can be analyzed by their features (tree types, sea shells, available blanket area), performance (weather quality, water conditions), identity (family fun, secluded privacy), "sexiness" (uhhhh), and the combination and congruity of all of these things. Yup, they sound like products! In that case, the latest "design" choice at some beaches is to ban the use of mobile productivity electronics - cell phones, PDAs, Blackberries, laptops, you get the picture. 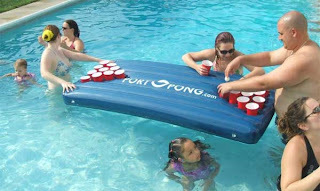 This makes the beach less convenient as a location - but much better as a product. At these beaches, your relaxation won't be interrupted by the nearby yuppie's conference call - or even by your own boss calling. A design choice to deny the user a convenience in order to preserve an ambiance is certainly gutsy - but in this case, I think, justified. 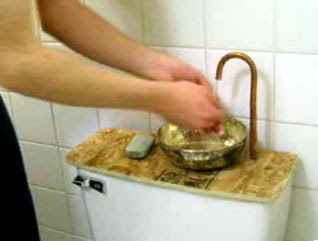 -Then, that water drains into the toilet tank (not the bowl), ready for the next time the toilet is flushed. 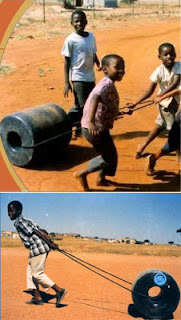 -When the toilet is flushed, the water you had used to wash your hands the previous time is used, along with however much more water was needed to fill the tank. 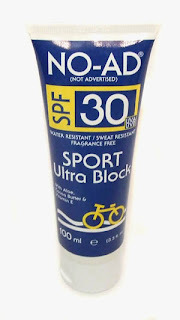 -A critical juncture is right here: the consumer must consider sunblock a commodity, where sunblock is sunblock is sunblock, no real differences between them. So, special features and brand loyalty aside, No-Ad becomes the obvious choice. -Now and for the rest of the product's use, the intended consumer feeling is the opposite of buyer's remorse: buyer's pride, for having saved some dough on a product that gets the job done. -And hopefully, that pride makes it into conversation! So, yes, it looks like they've got at least a plausible, "usable" business model here - and evidence confirms it, as they've been in business since 1960. Even better, it's not tricking the user - this one's really win-win. Here's to more of the same - and fewer ads everywhere!